Write poetry or a journal. We often have musicians come to the Mountains to write their music lyrics and songs. Heal a relationship. Get some quiet time to heal a broken heart or a relationship. Sometimes quality time and a beautiful landscape is all it takes. Remember to relax and communicate, when you get here. To get away from the concrete jungle. Some “city slickers” love the Great Outdoors. We have plenty of that here in the Smokies. Walk downtown Gatlinburg and remember how small the World can be. Gatlinburg has a little bit of something for everyone. Bring your pet. 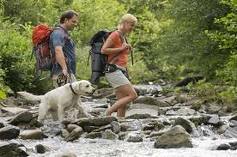 The Smoky Mountains is one of the Top pet-friendly travel destinations in the Country. Catch a Minor League Ballgame with your sons and daughters. The Tennessee Smokies is a great Double A team to grab a game with the Kids. The kids will love to be outdoors to watch baseball & grab a Ballpark hotdog with their Dad. Mothers and their daughters love to shop. We have both the best outlet shopping, as well as Arts & Crafts communities, in the country! No matter what you are looking for, you will find it here in Gatlinburg & Pigeon Forge, Tennessee. Fly fish or Trout Fish together as a family. You’ve seen the movie (or read the novel), “A River Runs Through It?” Well, live out family traditions here in the Smokies; go fishing in the Great Outdoors. Karoke-Lover? Gatlinburg has karaoke in several local pubs & restaurants throughout the week. Try the Smoky Mountain Brewery or Crawdaddy’s in Gatlinburg, if you love to sing Hank, Shania, or Journey! Girls weekend…or Guys. Get together with friends and grab a log cabin rental in Gatlinburg with friends. You can enjoy the area during the day, grill out at night, or enjoy your own log cabin in the Smokies with friends. It is a great way to catch up with friends once (or twice) a year! Take a hike on a special or secluded trail with your loved one. Make it a special annual event. Make that mountain trail your own & enjoy the conversation, exercise, and time together. The Great Smoky Mountain National Park has hundreds of trails, places to see, and wildlife to view! There’s not many places like the Smokies anywhere in the World. Enjoy!